Just when you thought you had done it all you hear about the Water Jetpack experience. It may seem as if it is an event for the future, but you can take part in the here and now. Once you have donned the safety equipment and sat through the safety instructions it will be your turn for your 10 minutes of flying above the water. You will feel as if you have moved forward decades as you don the state of the art equipment and get ready to fly. With the aid of a dolphin pump, you will be raised up above the water and everything else will leave your mind as you float above the people around you. If there is a lasting memory of the time you spent in Riga it is bound to be this. It will be hard to explain to your friends just how amazing this is, but as all of them will want to take part, you won’t have to. As long as there are 4 of you and you are in Riga between May and September you can take one giant leap for mankind above the water. Food and drink is not included, but transport is provided and you will have the services of a guide. Some history - the first jetpack was developed in 1919 by the Russian inventor Aleksandr Andreyev. 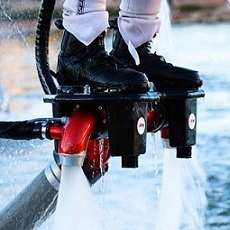 The 21st century brought us a new approach to water jetpacks where water is used as a high-density propulsion fluid. 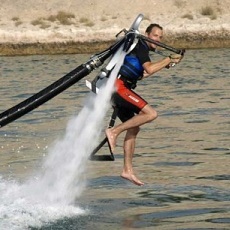 Water jetpacks can be operated below the water surface as well as above it. Starting from 2013, many water jetpack (also known as aqua jetpack) rental businesses are operating in different cities around the world. Flyboard is a board similar to the wakeboard with two pipes which, linked to a Jet ski turbine with a 16 meters pipe, allowing its user to get up to 10 meters above water. No previous experience is needed to join this extremely fun activity. Some people are saying that flying above the water is similar to skiing or snowboarding, so if you have done one of the mentioned before you will face no difficulties in controlling the flyboard or jetpack.